Why should I become a merchant at the Exit 76 Antique Mall??? To sell items that are no longer used -- if it's just collecting dust, make money on it instead! To get rid of that storage unit fee -- why store when you can sell? An ideal way to liquidate an estate or collection! If you're unable to get out and about, it's a great way to sell -- you can check your sales online! Why pay rent and overhead for a retail location and pay employees to sell your items, when we can do all of that for you? Track your sales as they grow, through custom Dealer Sales Reports provided by Mall-Central.com. This service is provided for ALL Exit 76 Antique Mall merchants, completely free of charge! 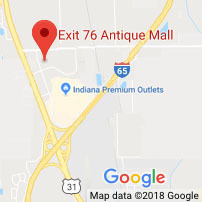 The Exit 76 Antique Mall is a one-level, climate-controlled and secure setting. Our Red Vest team is always ready to assist you with your needs. You can check your sales nightly, using the free Internet-based service provided with your merchant account. Why not become an Exit 76 merchant? Contact us at 812-526-7676, and start reaping the benefits today!